Unclear finish; tecnicos appeared to win the match, but Tirantes disqualified them after the fact for too may people in the ring. Fans were very unhapy. Rudos lost the first by excessive violence (too many people in the ring, probably), Hooligan pinned Cometa in the second, Cometa beat Arkangel to take the match. First Morphosis appearance in months. Rudos took 2/3, Psicosis and Morphosis beating Fantasma & Valiente. Mije was with the rudos. 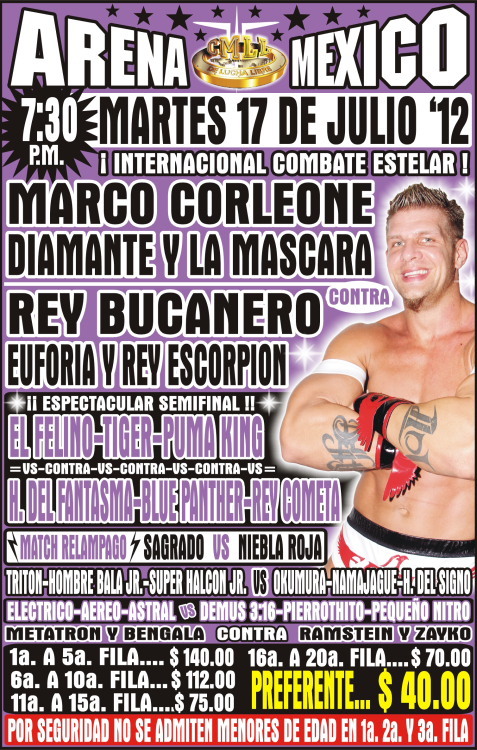 5) Marco Corleone, Rush, Shocker b Mr. Niebla, Terrible, Volador Jr.
Zac was with the tecnicos. Marco and Rush did their double dive from the ramp into the ring onto Volador & Niebla to beat them in the first, then Shocker bat Terrible to take it in straight falls. This sets up a title match next week. Malefico & Divino were not originally listed. Virus beat Sensei. Okumura came in with the belt. Seconds were Barbaro & Divino. Okumura won the first with a powerbomb, Sagrado tied it up with a quebradorda, Sagrado won the match and the title with a moonsault in the third. Okumura falls on his third defense. Mephisto blatantly fouled Atlantis in the third, then took his mask for good measure. Demus was hurt on Dragoncito's dive. Barbaro took 2/3. Javier accidentally kicked the ref, Barbaro fouled Javier, Barbaro checked the ref, Javier fouled Barbaro, ref saw the second ref and called the DQ. Rudos took 1/3, Averno pulling Azul's mask. Rudos took Voltron's mask for the DQ. Apache retained her title in a match not originally announced as title match (the recap and the pictures indicate the title was on the line.) Amapola asked for a rematch there in October. 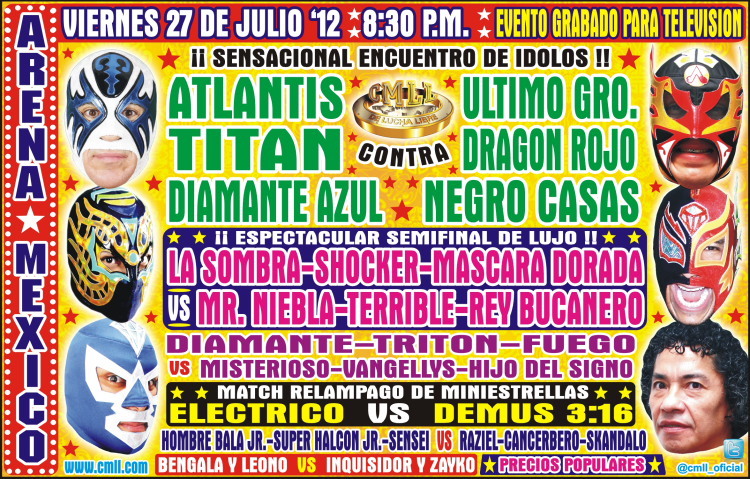 Event Notes: Volador Jr. vs Voltron was announced for 08/19, with the winner getting a title shot against Guatemala. 1) Black Tiger, Lestat, Tigre Rojo Jr. b King Jaguar, Policeman, Siki Ozama Jr.
Lestat, 29 years old and 10 years a wrestler, surprisingly announced his immediate retirement following the match. He said it was for personal and business reasons, but a tough one. 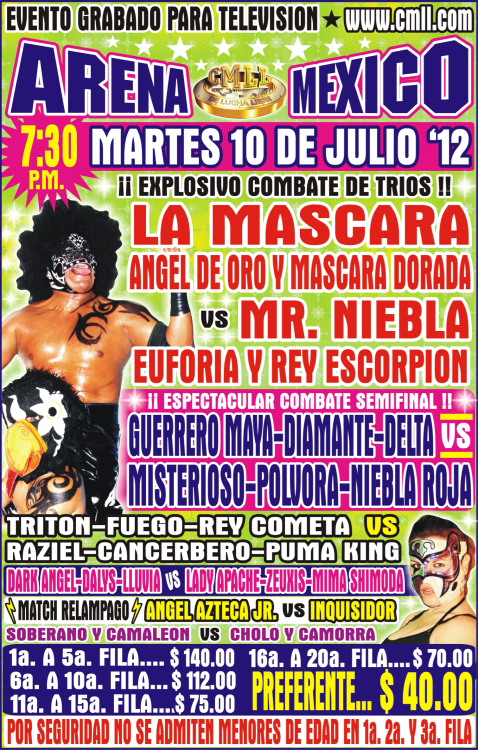 Tecnicos took 2/3, the second by excessive violence on Mascara. Terrible took 2/3 to keep the title. 4) Rush & Shocker vs Mr. Águila & Volador Jr.
1) Profecia & Thor vs Rostro Maligno & Zarpa De Tigre Jr.
3) Skayde & Turbo vs Black Thunder & Carta Brava Jr.
5) Cancerbero, Pólvora, Zayco vs Black Metal, Fuego (CMLL), Stuka Jr.
2) Infierno & Ráfaga b Halcón de Plata & Javier Cruz Jr.
Acertijo (attacking the tecnicos for the DQ), Smacker (helping the tecnicos), and In Memoriam (attacking the tecicos) all ran in. Tecnicos took 2/3, Malefico pulled Gallo's mask for the loss, then the other rudos pulled the other tecnicos masks. Azul took 2/3, winning the third with a German suplex. Unannounced lightning match, said to be best match of the night. Rudos took 1/3, Okumura pinned Cometa. 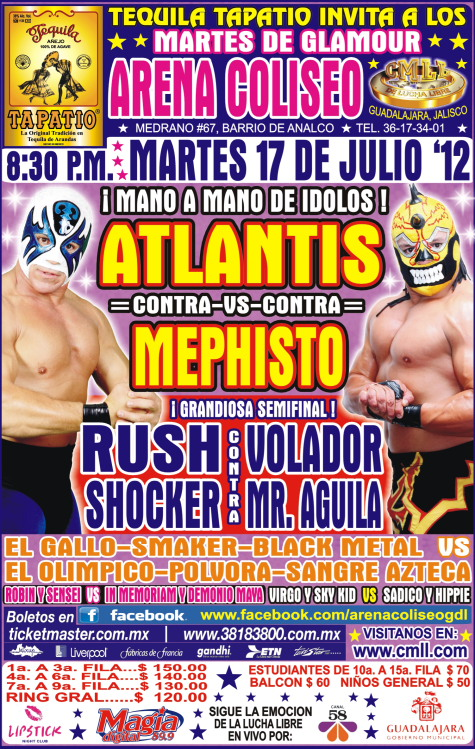 6) Atlantis, La Sombra, Máscara Dorada b Euforia, Último Guerrero, Volador Jr.
Demonio Rojo, debuting here, is another son of Javier Cruz. Divino & Brillante debuted matching gear. Announced as a lightning match, but they went 11 minutes. Halcon de Plata won with a small package. Rudos took 1/3, Mr. Trueno sneaking in a foul on Smaker. Challenged for a rematch and or a singles match next week. Tecnicos took 2/3, Malefico ripped off Gallo's mask for the DQ. Challenges for a singles match followed. Event Notes: The last evening Sunday show. They'll be starting at 12:30 from now until they change their minds again. Team pink shirt took falls 2/3. Rudos took 1/3, Kraneo submitting Valiente. Fans were behind the rudos. DF vs GDL ciberentico. Came down to Smaker and Sangre Azteca. Azteca fouled and ripped off Smaker's mask for the DQ.